The company in charge of maintaining stores on the Kew Gardens railroad bridge collects rents but fails to keep the premises in good shape, local merchants and elected officials said Wednesday. KEW GARDENS — The company in charge of maintaining stores on the Kew Gardens railroad bridge collects rents but fails to keep the premises in good shape, tenants said. The aging buildings have become a hazard as falling bricks and pieces of crumbling facades sometimes send residents scrambling for cover and put passing trains at risk as well, local merchants and elected officials said Wednesday. The owners of 13 businesses, whose stores are located on the Long Island Rail Road bridge on Lefferts Boulevard, between Austin and Grenfell streets said that the property operator — Long Island-based Zee N Kay Management LLC — has been ignoring their pleas to conduct basic repairs, like fixing a roof that has been leaking for years. "The facade is falling apart, paint is peeling off, what kind of management is this?" said Pradeep Agarwal, the owner of Accounting and Tax Services. Zee N Kay Management referred questions to its attorney who did not immediately return a phone call seeking comment. Nathalie Reid, who runs Thyme Natural Market, said that many times she had to pay for damages caused by lack of renovations out of her own pocket. "Our ongoing problems have been mostly frozen pipes in winter," she said. "Every time a pipe bursts, we have flooding and then we also have ruined inventory." A number of bricks fell from the facade and the bridge ceiling over the years, merchants said. Reid said that at some point she could see the train tracks through a hole in the floor at the back of her store. The hole has been since boarded up. "We are just being ignored and I don’t think that that’s fair because we come here every day, we open our doors and we help this community," Reid said. In March 2010, the MTA, which owns the property, awarded the property management contract to Zoya Kapoor and her company Zee N Kay Management LLC, according to documents provided by City Councilwoman Karen Koslowitz. But local elected officials and store owners said that Zoya Kapoor's husband Suresh — a former operator of subway newsstands who in 1987 pleaded guilty to tax evasion charges and was sentenced to 45 days in jail — has been running the business instead, Koslowitz and store owners said. The contract included a clause permitting Zoya Kapoor to assign her license agreement to “an immediate family member,” including her husband, even though the request for proposals said that the company owners cannot have a criminal record, Koslowitz said. 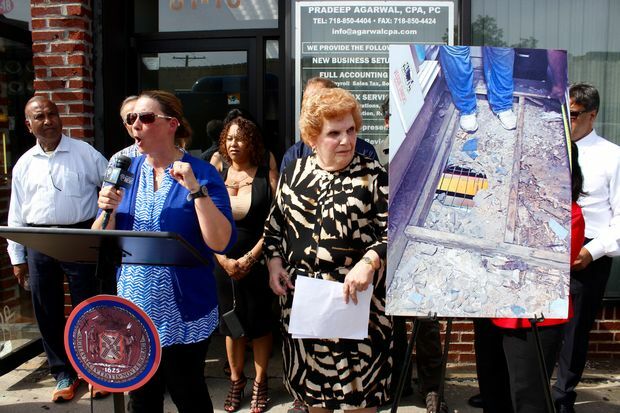 “The MTA simply cannot continue to stand idly by while their agent neglects these merchants and their property,” said Koslowitz at a press conference held on the LIRR bridge Wednesday. “These small businesses pay rent, taxes and are a positive and essential presence in this community,” she said. Koslowitz urged the MTA to cancel the contract with Zee N Kay Management and issue an RFP for a new property manager. Some business owners also said they would prefer paying rent directly to the MTA. LIRR spokesman Sal Arena said that the agency understands the concerns. "The LIRR has conducted a detailed assessment of the property’s physical characteristics," Arena said. "With the results in hand, we’re now working with all parties, including Zee N Kay Management, subtenants, and the MTA’s systemwide property management company, to ensure that all parties adhere to the responsibilities they agreed to in signing lease and sublease agreements." Arena also said that the agency "will ensure that electrical, plumbing, architectural and structural issues that have been identified will be attended to in a short time." The agency also said that it had determined in 2010 that hiring Zee N Kay Management where Suresh Kapoor was employed was appropriate.